24 Ways To Have Eggs For Breakfast! Get your morning cracking with the 24 breakfast egg recipes! This post is sponsored by Egg Farmers of Canada. To celebrate World Egg Day we teamed up with Egg Farmers of Canada and 23 Canadian food bloggers to bring you 24 ways to make eggs for breakfast (there's one from us as well!). You'll find so many easy, quick options here. Many are make ahead egg recipes (Yes! You can make eggs ahead of time and make them freezer friendly - how's that for saving time in the morning?). Some even use the Instant Pot! There's international flavours, savoury dishes, and recipes that look sweet enough to be dessert. Lots are grab and go friendly and they're all powered by that little perfect, power packed ingredient - the Canadian Egg. French Toast - it looks oh so decadent but it's oh so easy to make! 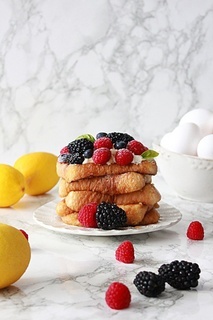 Fanny from **Oh Sweet Day** created this dreamy **[Lemon Vanilla French Toast](http://ohsweetday.com/2018/10/lemon-vanilla-french-toast-with-fresh-berries.html)** loaded with whipped cream and berries. Make it as an extra special brunch and nobody has to know how insanely easy it was to whip up! You can't celebrate World Egg Day without embracing global flavours. Sarah at **Flour and Spice** brings her Pakistani heritage to the table with [Khageena](https://www.flourandspiceblog.com/khageena/) - Pakistani scrambled eggs with onions and chillies and cilantro. Quick and easy and so satisfying! These **[Fruity Egg Bites](https://www.imagelicious.com/blog/instant-pot-fruity-egg-bites)** from Julia at **Imagelicious** are soft and fluffy and taste like a mix of pancakes and ricotta cakes. Cooked up in the Instant Pot they're so fast and so easy. Their sweetness come solely from the fruit and they'll look so pretty on your breakfast table! What happens when you combine a classic diner sandwich with eggs? Jennifer at **The Lemon Apron** did just that with her **[BLT and Cheddar Cheese Baked Eggs](https://www.thelemonapron.com/blt-and-cheddar-cheese-baked-eggs/)**. Only this time you'll use the bread as soldiers to dip up all the oozy gorgeous yellow yolk! For a different take on waffles Nazima from **Nutrition by Nazima** decided to create some less carb heavy waffles using hashbrowns and eggs! Toss in a classic Indian spice blend like Garam Masala and these [Indian Spiced Egg and Hasbrown Waffles](https://www.nutritionbynazima.com/single-post/Indian-Spiced-Egg-and-Hashbrown-Waffles) are a crispy, healthy and delicious breakfast that can even be eaten on the go! When breakfast is easy to make ahead there's no excuse for not having something hot and healthy to start your day. Ashley from **The Recipe Rebel** created this **[Sausage Egg Casserole](https://www.thereciperebel.com/sausage-egg-casserole/)** that you can cook ahead in the oven or the Instant Pot! Bread pudding always looks so decadent that it seems like it should be one of those dishes that's so complicated to make. But, that couldn't be farther from the truth! Mahy from **Two Purple Figs** picked seasonal pears to make this gorgeous **[Pear Croissant Bread Pudding with Creme Anglaise](https://www.twopurplefigs.com/pear-croissant-bread-pudding-with-creme-anglaise/)** and it's a stunner. Make this for a weekend brunch and your friends and family will think you slaved for hours! When you need something quick to grab on your way out the door then Tara from **Noshing With The Nolands** has you covered with her [Easy Breakfast Sandwiches On The Go](https://noshingwiththenolands.com/breakfast-sandwich-to-go/)! Click on the photos to be taken to the recipes.